Home › Moving Tips Blog › secure moving and storage › Why Do You Need Secure Storage? With so many homeowners in the Midwest and Northeast choosing to downsize these days, over 77 million baby boomers, the need for storage has more than tripled in the past 2-3 years. Choosing storage that is secure is very important and a downsizing homeowner should consider the following when looking for secure storage. Fenced and Gated. If the place you consider for secure storage is not gated and fenced then it is easy for an intruder to gain access. Well Lit. Most burglaries occur in the evening when it is dark. It is hard for even sensitive surveillance cameras to pick up someone dressed in dark clothes and intruding in the dark. Secure storage is always well lit at night. Surveillance Cameras. Most secure storage facilities will have surveillance cameras which will keep a record of any movement within the facility, day and night. Modern Facility. Secure storage is more than just about preventing theft, it also needs to be secure from the elements. Newer facilities need to meet the latest fire, wind, water and snow codes. Older storage facilities may not hold up well in storms and water damage is a major problem with some old storage buildings. Secure storage facilities always have regular monthly inspections to ensure that there are no bug infestations. In self-storage facilities the homeowner has direct access to put in and remove their own items. There is no way to tell if what they are putting into a unit is infested with bed bugs or other things which could harm your items. I remember one time, while receiving a wooden crate from another moving company, onto our loading dock, seeing a small hole in the crate, and, much to my surprise, a mouse jumped out of the hole and ran out into the warehouse. Within a few hours we had him lured into a trap and there were no issues. This is why secure storage facilities have bug and rodent controls in place. First Party Storage. Many moving companies that are found on the internet do not have the money to afford their own secure storage so, they “3rd party” the storage into, usually, self-storage somewhere. If the company you choose does not have a storage facility that you can inspect than you likely will not have very secure storage for your household items. Climate Controlled. Whether storing in the North or the South of the US, secure storage always is climate controlled for that area. In the North heat is very important for maintaining your furniture’s condition and, in the South, air conditioning is essential for preventing mold and mildew. One other thing downsizing baby boomers need to consider, when looking for secure storage, is to think about using storage that is close to where you will be moving to. So, if you are moving to Tampa, Florida, consider moving with a company that may have storage within a few hours of Tampa. This way you will have some contact with your possessions, once you arrive in the area. 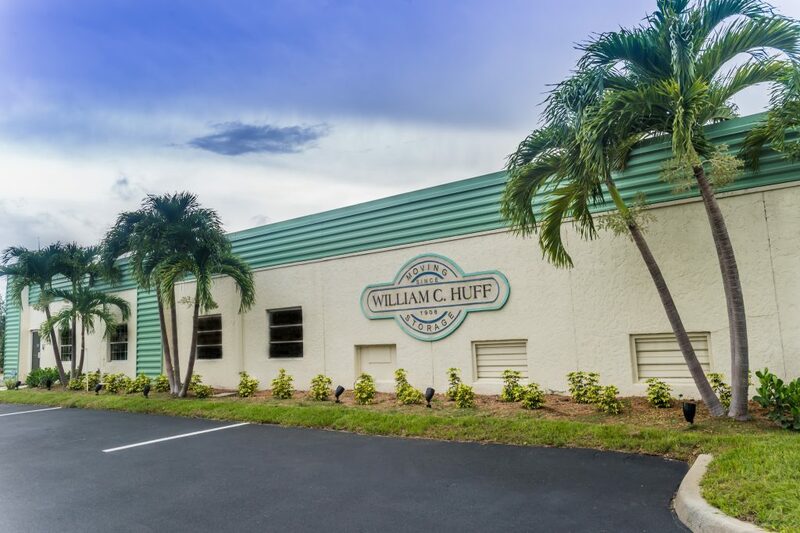 The William C Huff Company warehouse is conveniently located within 2 hours of Tampa, Miami, West Palm Beach and all other towns in Southwest Florida. And our 44,000 sq ft facility is not just completely secure, it also is the only warehouse in the area that is 100% environmentally friendly. All its’ power is generated using solar and eliminates more than 200,000 pounds of CO2 from our environment each year! !